FRONTLINE HomeGard is a household flea spray designed for use in your home and surrounding environments. It kills adult fleas and larvae in your home and prevents eggs and larvae developing there for approximately 12 months, providing enhanced year-round protection. Using FRONTLINE HomeGard in your home as well as FRONTLINE® Plus or FRONTLINE® Spot On on your pets provides an effective, integrated approach to flea control. FRONTLINE HomeGard is an aerosol surface spray for use on carpets, cracks and crevices in flooring, pet bedding and soft upholstered furniture, to eradicate fleas and prevent re-infestation. It’s not suitable for use on your hard furnishings as fleas don’t normally reside in these places. Fleas and ticks are nasty parasites that can transmit diseases and your pet can pick them up in various places. FRONTLINE Spot On is an easy-to-use flea and tick product from the UK's No.1 flea and tick brand*. Used monthly, it helps keep your cat protected from fleas and ticks, and the diseases they can transmit. Protects your dog against fleas up to 6-8 weeks and ticks up to 4 weeks. Frontline Spot On for Large Dogs (20-40kg) is a veterinary strength solution for the treatment and prevention of flea and tick infestations and the control of biting lice. As a non-systemic treatment, Frontline Spot On acts on contact and not via your dog's blood allowing for easy application using the pipettes included. Frontline Spot On kills 98-100% of fleas within 24 hours for approximately 2 months and kills ticks within 48 hours for up to 1 month, minimising the risk of disease transmission after treatment. 1 in 3 ticks in the UK carries an infectious disease that may affect dogs2. Lyme disease and canine babesiosis are examples of tick borne diseases. Lyme disease is a bacterial infection which can be transmitted via a tick bite to humans as well. Both dogs and humans can experience serious symptoms and require medical treatment. Canine babesiosis is specific to dogs and is a malaria-like parasitic disease which can be fatal. Affected dogs require immediate medical treatment. This product is easy-to-apply to dogs, apply on the skin at the base of the neck in front of the shoulder blades. Our Eye Cleaner is a neutral cleansing solution for the eyes and surrounding areas in dogs and cats, developed by veterinary experts. Its crystal clear composition mimics natural tears for safe and gentle removal of debris and stains from around the eyes. 1 Seat yourself comfortably and put your pet at ease with gentle stroking, apply the cleaning solution to cotton wool pads, one for each eye. 2 Hold your pet's head steady, start with one eye and apply the cotton wool pad gently to soften dirt or debris, carefully work from the inside of the eye outwards. 3 Repeat with other eye. 4 The eyes are now clean. 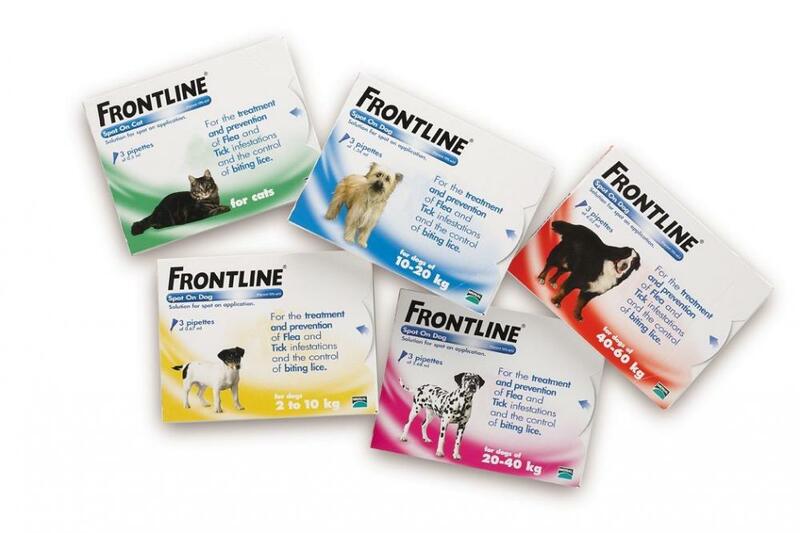 Frontline knows that your pets' health and wellbeing is important to you so we created a new range of products devoted to pet care, Healthy never felt so good! 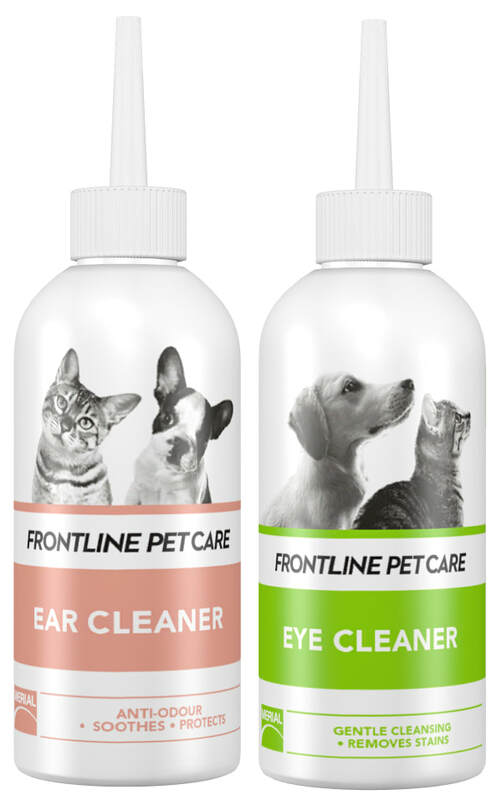 Our Ear Cleaner is a cleansing gel for dogs and cats that also soothes the ears, developed by veterinary experts. Zinc and Rhamnose, a polysaccharide compound that inhibits bacterial adhesion to the skin, help balance the delicate ecosystem of the ear canal and soothe sensitive and fragile skin. 1 Have the product and some cotton wool ready, sit comfortably and put your pet at ease with gentle stroking. 2 Lift one ear and apply a few drops of the product just inside the ear, not too deep, then massage the ear canal gently. 3 Take the cotton wool and wipe from the entrance of the canal to the top of the ear. 4 Repeat with other ear. 5 The ears are now clean. Our Paw Balm is developed by veterinary experts to moisturise and protect the sensitive areas of the feet in dogs and cats. A blend of soothing and hydrating ingredients including Provitamin B5 combined with the barrier effect of Zinc oxide, help to protect from snow, hot roads and irritants like sand and salt. How to use: Apply generously to clean, dry skin between pads and toes.